Knee pain, swelling and stiffness after total knee replacement (TKR) surgery are well-recognised complications. However, in some cases, despite investigation, the cause may be unexplained. This study, using a questionnaire sent to South African orthopaedic surgeons, examined the perceived incidence of unexpected knee pain and swelling after a straightforward TKR, aiming to identify possible associated or contributory factors. Of the 61 respondents, two-thirds had more than 10 years' experience and close to three-quarters performed 20 or more TKRs per annum. Less-experienced surgeons report a greater frequency of unexpected pain than more-experienced surgeons (90% vs 53%) (p<0.05). Similarly, surgeons using the visual analogue scale (VAS) to assess a patient's pain also have a greater awareness of unexpected pain. Two-thirds of surgeons reported finding more pain than had been anticipated in between 6% and 20% of their cases. Unexpected swelling is also an issue. Approximately one-half of surgeons could identify the cause for pain in less than 5% of their cases. Surgeons who use drains and have shorter surgical times reported a reduced incidence of unexpected pain and swelling, although this did not reach statistical significance. No suggestive relationships were found for other peri-operative parameters such as analgesic regimens, thrombo-embolic prophylaxis or mobilisation protocols. Total knee replacement (TKR) surgery has revolutionised the care of patients suffering from degenerative or inflammatory arthritis of the knee. The goal of treatment is a pain-free, stable knee joint which allows good function for activities of daily living. There are a myriad causes for a poor outcome. Often the clinical picture is a spectrum of both pain and stiffness, but many authors report one or the other as the predominant symptom. The prevalence of postoperative pain and stiffness varies in the literature. Studies quote figures from 1.1% to 10.8%1-7 (Table I). The overlap between pain and stiffness varies between papers, and there is an inconsistent definition of stiffness which varies from 70º to 95º of flexion.1-7 Swelling may be associated with both of these groups but it was not reported as an outcome in our literature search. In the Orthopaedic Department at the University of Cape Town it has been recognised that some patients - for whom the results were anticipated to be excellent after a nominally 'simple and straightforward' TKR - had much more pain and swelling than was expected. This delayed their rehabilitation, decreased their range of motion, prolonged their hospital stay, and correlated with a poor medium-term outcome. For many of them a specific cause for their pain and swelling could not be identified. Whether this is inherent to the patient's response to the surgical assault, or as a result of a preventable cause, are two possible options to explain this phenomenon. The aim of this study was to assess the perceived incidence of these problems among knee surgeons in South Africa and to see whether any surgical or other peri-operative intervention or variable appeared to play a role in the presence of postoperative pain, swelling and stiffness. This study was conducted via a survey dealing with perioperative management practices of South African Orthopaedic Surgeons performing TKRs. A comprehensive questionnaire was sent to members of the South African Orthopaedic Association (SAOA), focusing on the surgeon's perception of unexpected and unexplained postoperative pain and swelling. Following this, the intention is to perform a prospective study guided by recommendations arising from this survey. A survey of South African knee surgeons was performed using the database for the South African Orthopaedic Association (SAOA). Of the 550 members, 150 were still in training or no longer actively performed knee arthroplasty. One hundred-and-twenty surgeons on the database had incomplete or inaccurate contact email addresses. Thus 280 questionnaires were sent to generalist and specialist surgeons who perform total knee replacements. Following a pilot study assistance for the design and data content was obtained from a biostatistician. 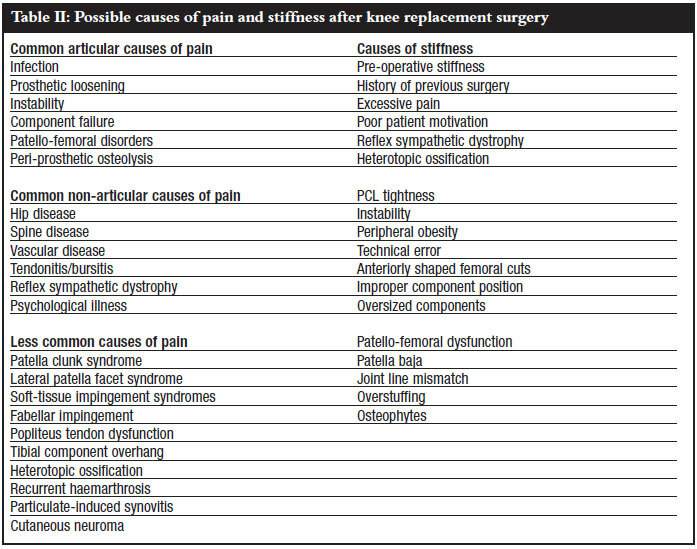 The questions covered multiple aspects of peri-operative assessment and care of a patient after a total knee replacement (TKR), including the following: surgeon demographics, implant variations, operative techniques including use of tourniquets, haemostasis and drainage, medical interventions including analgesia, anticoagulation and antibiotic use. The incidence of 'more pain than was expected' and the ability to identify causes for that pain were also examined, as was the occurrence of 'more swelling than was expected' and the assessment of that swelling. The investigation of infection, the mobilisation programme, and the consideration of manipulation for stiffness were also included. For the purpose of this study the following definitions of terms used as relating to symptomatology apply. 'Unexpected' implies a subjective assessment of such occurrence in the experience of the observer. 'Unexplained' implies a symptom which cannot be shown to have a demonstrable cause. The questionnaire was converted into an Excel-based spreadsheet for email communication and online completion. The respondents were grouped according to their response to the questions on pain and swelling. Subsequent comparative analysis of the variations in perioperative parameters in these groups was then performed. Of the 280 questionnaires sent out, 61 respondents returned a completed questionnaire (22%). Thirty-two per cent of the respondents were also members of the South African Knee Society. Ninety-two per cent (56/61) of reporting surgeons practise in the private sector. Less-experienced surgeons (<10 years) comprised 34% (21/61) and surgeons with more than 10 years' experience made up 66% (40/61). The number of cases performed each year was also taken as a measure of experience, with 17 (28%) performing fewer than 20 TKRs per year. Only eight (13%) 'high-volume' surgeons performed more than 100 cases per year. Thirty-five per cent performed 20-50 cases per year, and 23% between 50 and 100 cases per year. Surgeons were asked to indicate the technique/implant which they used most frequently. Sixty per cent used mobile bearing knees. Twenty per cent retained the posterior cruciate ligament. Only 18% routinely resurfaced the patella. Computer-assisted surgery was regularly used by 15% of respondents for their cases. Sixteen per cent of surgeons perform an average knee replacement in under an hour, with only another 16% typically taking longer than 90 minutes. Only 10% of respondents do not use a tourniquet, and 10% do not use drains postoperatively. All surgeons use prophylactic antibiotics. The majority (95%) choose a first-generation cephalosporin. The duration of use varies: 7% give a second dose at 8 hours, 66% continue for 24 hours and 26% for more than 24 hours postoperatively. Thrombo-embolic prophylaxis is often performed in a combined synergistic approach. Eighty-five per cent of surgeons use low molecular weight heparin (LMWH), 10% use Warfarin and 5% use aspirin as chemical prophylaxis. Mechanical prophylaxis with foot pumps is used by 72% and graduated compression stockings by 80%. Of those using LMWH, 50% prescribe it for less than the recommended 10 days, and 30% use it for longer than 21 days. Twenty-five per cent commence it on the day before surgery, 50% on the day of surgery and 25% on the day following surgery. For postoperative pain and swelling, all surgeons use oral preparations, 80% use NSAIDs, 70% use IM injections and 65% prefer IV opioid/PCA pumps. Only 11% use a systemic steroid. None use intra-articular steroids or intra-articular pumps. 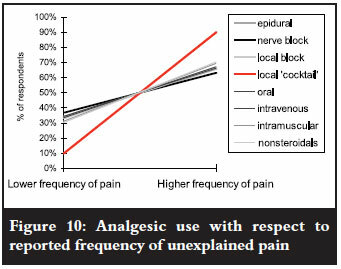 Roughly equal numbers use each of the regional anaesthetic techniques; 47% prefer epidurals and 43% employ nerve blocks. Twenty-six per cent use local anaesthetic in the wound, and 19% of surgeons use a local 'cocktail' preparation. For assessment of patients' pain, 23% used a scoring system such as the Visual Analogue Scale (VAS). The remainder employs clinical judgment. For assessment of swelling, 28% used a tape-measure to assess swelling. No other modalities such as volumetry, ultrasound or MRI were used. With the benefit of hindsight, a more detailed interrogation should have been undertaken with regard to stiffness. However, 50% of surgeons refer patients for a pre-operative physiotherapy programme, presumably to maximise their pre-operative range of knee motion. Postoperatively, 25% of respondents mobilise their patients on day 1, 50% on day 2 and 25% on day 3. Sixty per cent of surgeons will allow their patients home with <90º flexion. With regard to performing a manipulation under anaesthesia (MUA) for a stiff knee, 60% will consider an MUA before 6 weeks, 25% only consider an MUA after 3 months and 15% do not consider an MUA to be necessary at all. 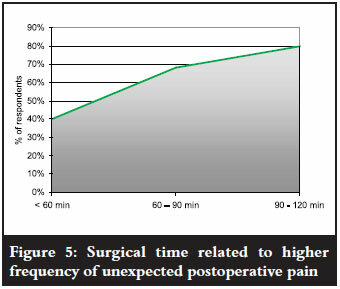 Only one respondent claimed never to see more pain than expected in the postoperative phase; 33% seldom (1-5% of cases) saw more pain than they expected, whereas 60 % reported an incidence of 6-20% unexpected postoperative pain. 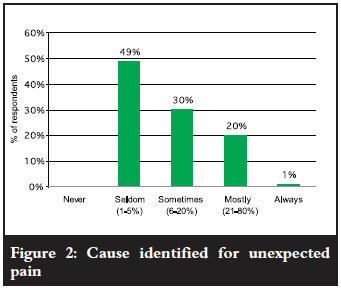 Seven per cent had a high incidence (21-80%) of unexpected pain in their patients (Figure 1). This unexpected pain is essentially unexplained in the majority of cases, as half the respondents fail to find a cause more than 95% of the time. Thirty-three per cent sometimes find a cause, and only 17% are satisfied that they mostly find a cause for this postoperative pain (Figure 2). 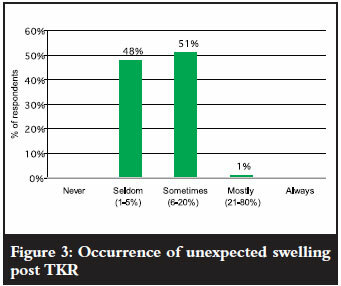 Half the respondents seldom find unexpected postoperative swelling to be a problem, but the other 50% do find swelling to be more than they expected in between 6% and 20% of their cases (Figure 3). 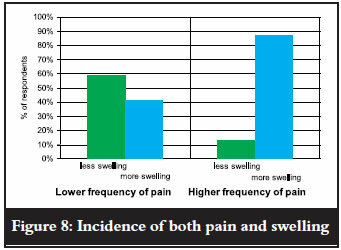  29 (48%) reported a higher incidence of unexpected swelling (>6% of cases). The data was analysed for trends or significant differences between the groups with respect to demographics, surgical techniques and other peri-operative variables. Less experienced surgeons reported a higher incidence of unexpected pain: those who performed fewer than 20 cases per year (76%) vs those who performed more than 100 cases per year (22%) (p<0.05). Similarly, of those who had <10 years experience, 90% reported unexpected pain vs 53% of those who had >10 years experience (p<0.05) (Figure 4). This association was statistically significant. The surgeons who took longer to complete a TKR also reported a higher incidence of unexpected pain: 80% of surgeons who took longer than 90 minutes were in the group with a higher incidence of unexpected pain (p>0.05) (Figure 5). 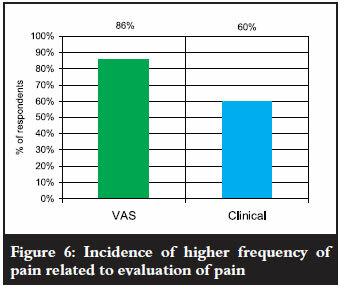 The surgeons who used a VAS scoring system for pain assessment reported a higher incidence of unexpected pain from their patients: 86% vs 60% of those only using clinical estimates (p>0.05) (Figure 6). 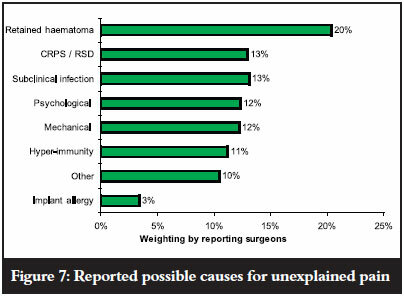 Suggested causes for unexplained pain are recorded in Figure 7, with retained haematoma considered the most likely. The surgeons whose patients had a relatively high incidence of unexpected pain also reported a higher incidence of unexpected swelling (87%), i.e. more often than not a higher incidence of unexpected pain is associated with more (unsuspected) swelling. Fifty-nine per cent of those who reported a low incidence of pain also had a low incidence of swelling (p<0.05) (Figure 8). A result which is somewhat counter-intuitive is the fact that swelling was not seen to be as much of a problem for the inexperienced surgeons as for the experienced surgeons. Only 29% of surgeons doing <20 cases/year were in the group reporting a higher incidence of swelling, but 78% of those doing >100 cases/year were in that group (p<0.05). The surgeons who did not use drains also reported a higher incidence of pain: 86% vs 63% were in the high incidence group (p>0.2). This group of surgeons also reported more swelling (71% vs 44%) (Figure 9). Ninety per cent of those who used local peri-articular injections with a 'cocktail' of agents were in the higher incidence group of reported unexpected pain. This is a notable deviation, although not statistically significant, as no other analgesic regimens differed from the average response of 33% (low pain incidence) vs 66% (higher pain incidence) (Figure 10). For all the other parameters investigated there were no marked positive or negative deviations from the mean to warrant further evaluation or discussion. As this survey shows, TKR surgery is not without unexplained problems. While the assessment of symptoms is mostly subjective, all surgeons, to a greater or lesser degree, were surprised by the amount of pain or swelling which they did not expect to encounter after the procedure. Less experienced surgeons report a higher incidence of unexpected pain when compared to more experienced surgeons. While this is most likely due to the fact that they have not yet recognised that this procedure evokes more pain than they expect, it is possible that their surgical experience may play a role, although there was no difference in lengths of theatre time between the two groups. The more-experienced surgeons report a higher incidence of unexpected swelling when compared to the inexperienced surgeons. This may reflect a greater awareness for excessive postoperative swelling, or it may represent a difference in the level of expectation between these two groups of surgeons. Postoperative swelling is a 'normal' occurrence due to the inflammatory response to surgical trauma, but mediators should return to baseline levels by day 7. Swelling does not always follow. This is probably due to generalised tissue oedema, and impaired lymphatic and venous drainage, but it may also be due to retained haematoma. 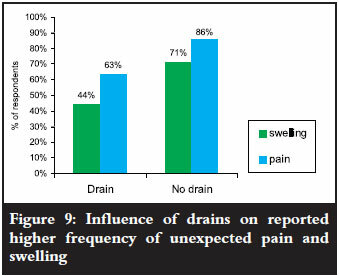 Wound drainage is very popular despite several studies showing no difference in outcomes whether or not drains are used.11-14 This current study suggests that those who use drains have a lower perceived incidence of pain and swelling in their patients. Tourniquets have also not been shown to have a proven beneficial outcome,15-17 and yet 90% of respondents use them routinely. Excessive postoperative pain inhibits motion leading to intra-articular and periarticular adhesions which in turn lead to an inflammatory reaction and more pain. Heuleu and Neyret18 reported that, with proper pain control, the incidence of manipulation after TKR decreased from 9% to 1%. Local 'cocktail' injections are gaining in popularity and are being used to good effect in New York by Ranawat et al.23 This current study showed that surgeons who identified pain as a postoperative problem more frequently employed this modality. Although not interrogated by the questionnaire, it is likely that these surgeons employ this technique because of their increased awareness for the need to obtain better pain control in the postoperative period. It has been shown in reports that unexplained pain varies from 4% to 18% at 6 months. 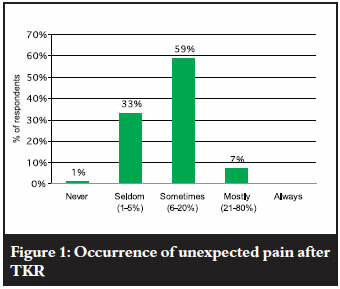 Elson and Brenkel7 evaluated their series of 622 TKRs and found an incidence of 4% unexplained pain at 6 months. They report that half of these patients recovered over the subsequent 5 years, and that surgery for unexplained pain had a poor outcome. Perhaps such discrepant reporting, from the incidences reported in Table I, is due to the lack of a standardised scoring system or inadequate assessment of patients' pain, swelling and function. In our survey less than a quarter of surgeons currently attempt to assess pain using a validated system, such as the VAS. When the VAS was used, these surgeons reported a higher level of unexpected pain in their patients compared to the subjective group, perhaps demonstrating that the more one measures an outcome, the higher the reported incidence of that outcome - the classic 'Hawthorn effect'! The definition of stiffness varies. An acceptable flexion range may be 75º for one report, yet 95º for another. Flexion to 90º seems to be the most commonly recognised limit of acceptability.1-6 Unfortunately, due to limitations in the questionnaire design, the correlation between swelling and stiffness could not be made from the data obtained from this study. Manipulation is an effective form of management for the stiff TKR, although care needs to be taken not to rupture the patella tendon or cause a fracture. Both Daluga et al.33 and Yercan et al.5 have shown that an earlier manipulation under anaesthesia (MUA), less than 3 weeks postoperatively, yields better results in the long-term than those done between 3 weeks and 3 months. Sixty per cent of respondents reported performing an MUA before 6 weeks. Twenty-five per cent preferred to wait 3 months. There was no difference between these groups with respect to the reported occurrence of pain and swelling. The results of this survey show a marked variation in peri-operative management options among surgeons, as is demonstrated by the differing responses with respect to analgesic regimens, thrombo-embolic schedules, and rehabilitation programmes. Many questions, including the following, are raised by the findings of this study. In the uncomplicated TKR how much pain and swelling and stiffness should one expect? When does pain and swelling subside? At what rate should the range of motion return? How frequently can a cause simply not be found despite rigorous and exhaustive investigation? When we can't explain it, what is causing it? The low rate of returned questionnaires (22%) weakens the power of this study; however, one third of the Knee Society members approached did complete questionnaires. The reluctance to complete forms, difficulties with the online Excel familiarity and 'too many questions' are possible reasons for this occurrence. While the investigators were not 'blind' to respondents' names - leading to possible concerns around prejudice/bias - this information was not used for comparison of individual surgeons, and did not alter the interpretation of results. With the benefit of hindsight some additional questions, in particular relating to stiffness and its relationship with pain, would have been added. Also, the temporal occurrence of these complications was not adequately delineated, with perhaps an overlap in interpretation of questions.  Unexpected pain and corresponding swelling and stiffness are indeed a problem, and not uncommon. More often than not such pain and swelling cannot readily be explained.  Less experienced surgeons - whether in years or number of TKR operations performed each year - report higher incidences of unexpected pain. However, more experienced surgeons had greater awareness of unexpected swelling.  Reduced levels of unexpected pain and swelling are reported by surgeons who use drains, and have shorter surgical procedure times.  Surgeons employing the 'local cocktail injection' technique report a higher incidence of unexpected pain than those who do not.  Among those employing objective quantitative evaluation methods (such as the VAS or a measuring tape) a higher incidence of unexpected pain and swelling are reported.  Current reported operation and peri-operative interventions vary widely making interpretation difficult. I am indebted to the surgeons who gave of their time to complete the questionnaire and participate in this survey. Thank you. Approval for the study was obtained from the Surgical Departmental Research Committee and the Ethics Committee. The content and preparation of this paper is the sole work of the authors. No benefit of any form was or will be received from a commercial party related directly or indirectly to the subject of this article.